Average score 9.31 out of 10 , based on 8072 reviews8072. Want to do something when a user opens a workbook, or stop them clicking on a particular cell? You need to learn how to attach code to Excel workbook or worksheet events! This series of blogs is part of our Excel VBA online tutorial. If you want to learn more, have a look at our classroom-based courses in VBA macros and/or Excel. You can attach code to events for any worksheet in the same way as for a workbook. The steps for how to attach code to a particular worksheet are shown below. Double-click on the worksheet in question. Click on the drop arrow next to General and choose Worksheet, the only object available in the list. Click on the right-hand arrow and choose the event you want to attach code to. There are fewer events in a worksheet's life than a workbook's - does this mean they're less interesting? The rest of this page contains some examples of macros that you might write - as for the workbook examples, they are not meant to be taken seriously (although they do perfectly illustrate what is possible). We want to stop anyone clicking on the cell shown - and punish anyone who does! MsgBox "It did warn you ..."
In this case, if you select any range containing C2 the nasty little macro will erase all of the cells in the current worksheet. The really scary thing about macros like this one is that in Excel you can not undo the results of running a macro (although strangely you can in Word). If a user types in an odd number, we want to react to it. MsgBox "No odd numbers allowed"
Here we check if the user has changed the value of a single cell in row 2, column 3 (we could also have checked if the cell's Address property had equalled $C$2, noting that this is case-sensitive). 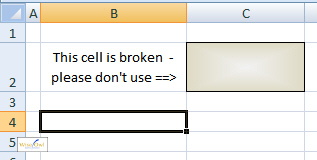 It is difficult in VBA to reset a cell's value back to the previous value for a macro like this - some fairly advanced ideas for how to do this can be found here and here. You may now have reached this point in this online tutorial and be smugly thinking that your user can not now do anything untoward. However, users can bypass macros - read on!